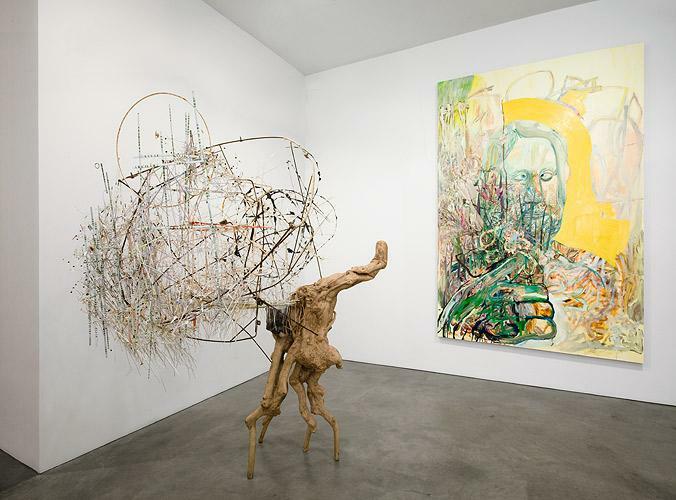 There has always been a remarkable enthusiasm for the work of Elliott Hundley and it has been a particular pleasure to witness the continued growth of interest in his practice and to share his work with more and more people. 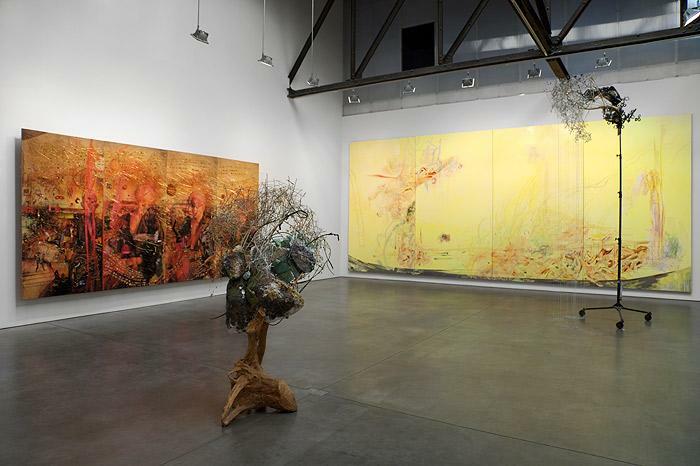 Coming on the heels of a fantastic year for Hundley, we are pleased to announce his second solo exhibition in New York. 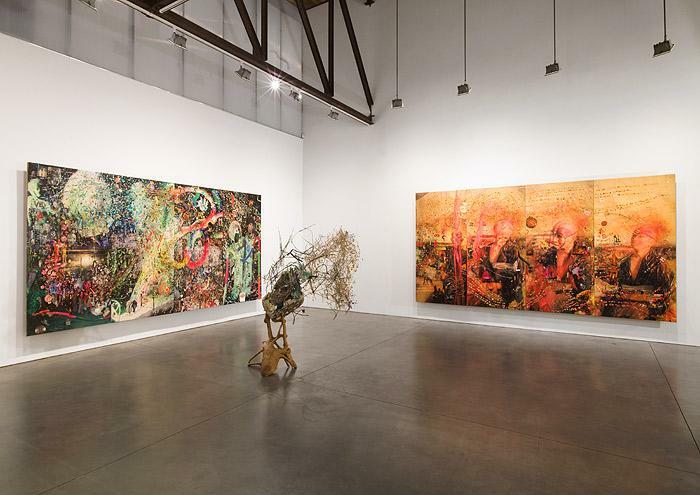 Working across the widest array of media, Hundley ruptures the boundaries between collage and painting, performance and photography, sculpture and assemblage. Bringing form to the Greek tragedy The Bacchae by Euripides, this exhibition draws from Hundley's interest in mythology, art history, philosophy, and drama. The new works are titled after the play's central characters, becoming elaborations of the characters themselves – the gallery is transformed not so much into a stage set, but into the physical evocation of the text. Transcending illustration, the play works as a vehicle to explore ideas of exuberance and ecstasy, mourning and remembrance, and the construction of form. 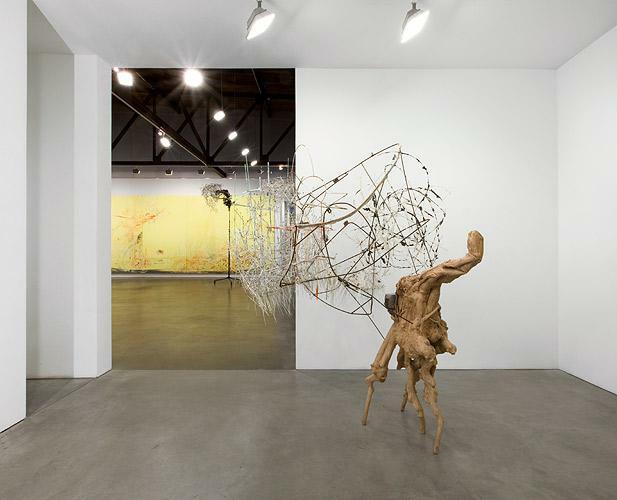 Hundley's work is always marked by a dual intensity of labor. He begins by photographing people, costumed or made-up, performing actions and sometimes even restaging parts of the subject matter he is working though. These photographs then become raw material. The conceptual and physical effort spent in creating this material is what allows Hundley's next layer of process to be so organic and free in its making. For this exhibition, the photographs are also enlarged and printed on rice paper to serve as the base for three large, wall-bound works. Studded with thousands of pins holding meticulously cut out images, words, and objects; the resolution of the photographs gives way to an optically dazzling and abstracted surface. Images, narrative and language fracture a linear reading of the past and show instead a quivering, shimmering, and ever changing image that allows us to marvel at the endless permutations of human culture. 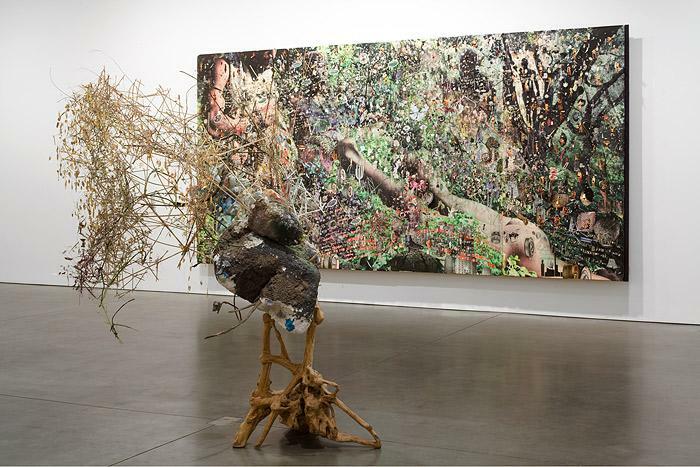 This exhibition shows Hundley pushing his exploration of scale even further and interrogating the limits of perception. 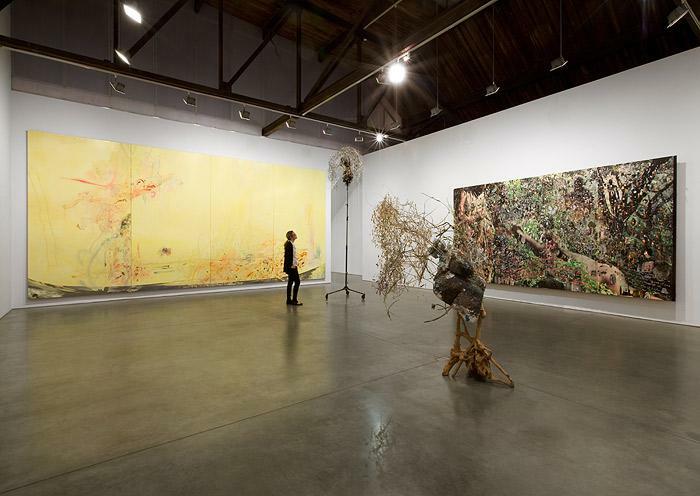 The works are not only physically overwhelming in size, but also in detail. 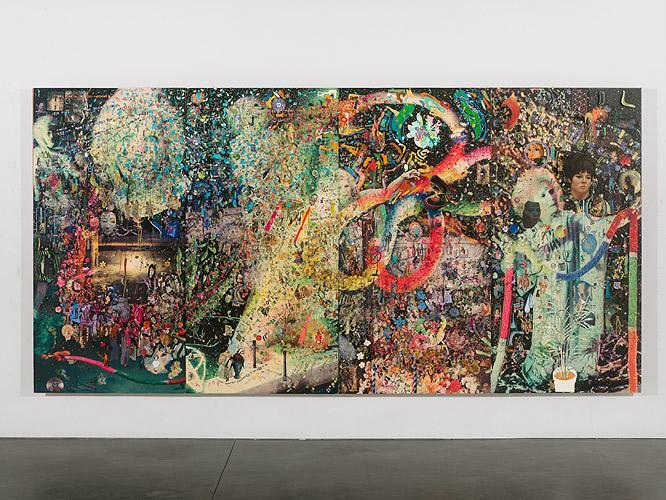 From every individual element—hundreds of meticulously painted plastic straws, thousands of images adhered with pins of varying color and length, strings carefully drawn across a work—emerges new and complex constellations. Such scale and detail confounds attempts to apprehend a unified, singular image and generously provides the viewer with greater possibilities of seeing the world. The Bacchae explores the boundaries between reason and ecstasy and the complicated nexus of justice and violence. In the play, the women of Thebes are compelled to leave the city to perform Bacchic rituals in the hills after the city refuses to recognize the god Dionysus. Persuaded to spy on the women by the god, the young king Pentheus is violently killed by his mother who only realizes what she has done at the end of the play. Though most Classical plays are incomplete with sections lost over the millennia, The Bacchae is unusual in how much is missing and from where. Referred to as The Great Lacunae, the text covering the most climactic section of the story is missing. From this gap, springs interpretation. With its richness of material and visual pleasure, its embrace of content, and engagement with narrative, Hundley's work is not only built up but also formed by erasure. 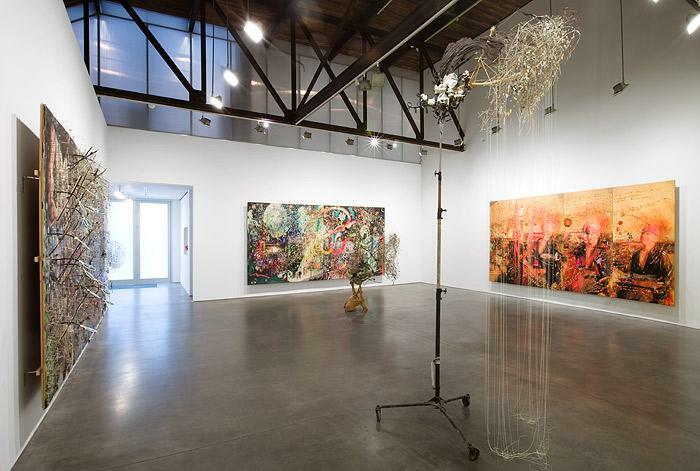 Within his plan for this exhibition, Hundley purposefully creates a stage for the viewer, which allows the work to become a space for projection and a catalyst for meaning. 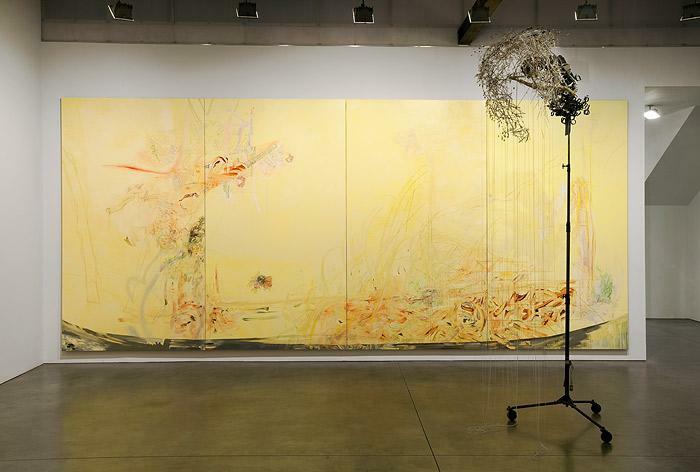 As though speaking about Hundley's work, the last lines spoken by the play's chorus proclaim: "They do not bring about what we expect, and they find out ways for the ends we never meant." 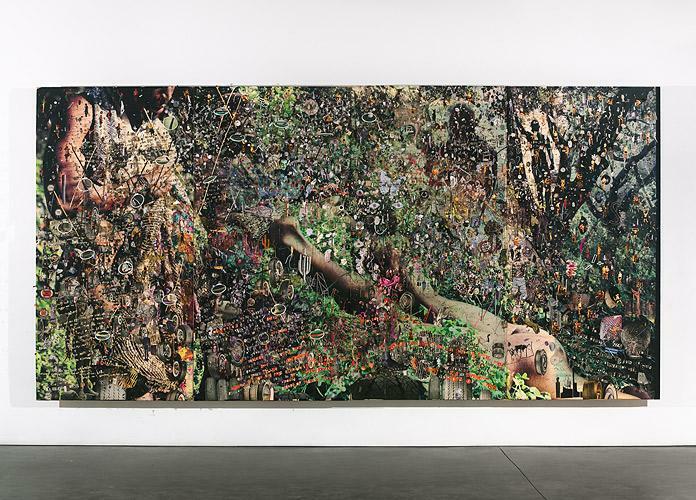 Elliott Hundley is currently included in "Skin Fruit: Selections from the Dakis Joannou Collection," curated by Jeff Koons at New Museum of Contemporary Art, New York, "Collection: The First Thirty Years" at the Los Angeles Museum of Contemporary Art, and "Contemplating the Void: Interventions in the Guggenheim Museum Rotunda" at the Solomon R. Guggenheim Museum, New York. 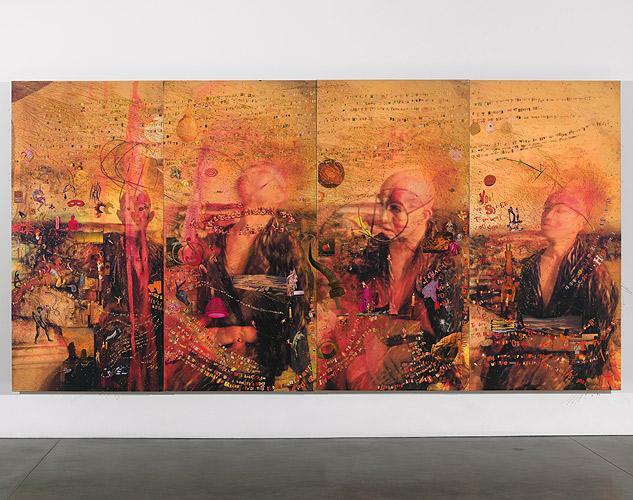 Hundley's work is in the collections of the Museum of Modern Art, New York; the Solomon R. Guggenheim Museum, New York; the Museum of Contemporary Art, Los Angeles; the Los Angeles County Museum of Art, and most recently the Louisiana Museum of Modern Art, Denmark. Hundley lives and works in Los Angeles.